Grab your compass, jump into your boat and set sail for new and exciting Minecraft™ adventures. Discover the remote, brightly colored Mushroom Island, complete with huge red and brown mushrooms. Use your pickaxe to mine valuable resources, craft and create at the crafting table, and grow vital crops and wheat for the mooshroom and her baby. But look out for the exploding Creeper™ lurking on the island! 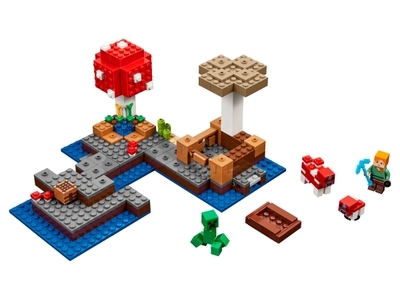 The The Mushroom Island (21129) Lego set is no longer directly available from the sites below. However, 3rd party partners of these sites might still have the set available. Alternate description Discover The Mushroom Island!